The Brugada syndrome is a relatively new clinical entity, which was first described in 1992 by brothers Pedro and Josep Brugada 1. The Brugada syndrome is an autosomic dominant genetic disease. It is characterized by ST segment elevation in the right precordial leads (V1-V2) and a high incidence of sudden death in patients with structurally normal heart due to ventricular arrhythmias 2. The incidence of this disease is on the order of 5 per 10,000 inhabitants and it thought to be responsible for at least 20% of deaths in patients with structurally normal hearts 2. Three types of EKG patterns are recognized in patients with Brugada Syndrome, different patterns may be observed in the same patient. Type 1 is the only EKG diagnostic pattern of Brugada syndrome. This pattern was described by Brugada brothers in 1992, it is characterized by a prominent coved ST segment or J point elevation ≥2 mm (0.2 mV) followed by a negative T wave in at least one right precordial lead (V1 or V2), which are placed in a standard or a superior position. Coved ST segment elevation en V2 > 2 mm followed by a negative T wave. This pattern has high take-off ST segment elevation >2 mm followed by a descending ST elevation remaining followed by a positive T wave with saddleback morphology. It has a "saddleback" appearance. High take-off ST segment elevation >2 mm followed by a descending ST elevation remaining followed by a positive T wave with saddleback morphology. This pattern is similar to Type 2 EKG, it has either a saddleback or coved appearance, but with an ST-segment elevation <1 mm. ST segment elevation <1mm followed by a positive T wave. In patients with Brugada Syndrome, the morphology of ST segment elevation varies considerably day by day. The three patterns may be observed sequentially in the same patient. To increase diagnostic sensitivity, in 2013 the HRS/EHRA/APHRS expert consensus omits any clinical criterion and demands diagnostic EKG changes in only one right precordial lead 3. From: HRS/EHRA/APHRS Expert Consensus Statement on the Diagnosis and Management of Patients with Inherited Primary Arrhythmia Syndromes 3. 1. Brugada Syndrome is diagnosed in patients with ST-segment elevation with type 1 morphology ≥2 mm in ≥1 lead among the right precordial leadsV1, V2, positioned in the 2nd, 3rd or 4th intercostal space occurring either spontaneously or after provocative drug test with intravenous administration of Class I antiarrhythmic drugs. 2. Brugada Syndrome is diagnosed in patients with type 2 or type 3 ST-segment elevation in ≥1 lead among the right precordial leads (V1, V2) positioned in the 2nd,3rd or 4th intercostal space when a provocative drug test with intravenous administration of Class I antiarrhythmic drugs induces a type I ECG morphology 3. With the clinical diagnostic criterion no longer being used, risk stratification plays a critical role to identify patients with high risk of sudden cardiac death 4. Since Brugada Syndrome was described 1, several clinical variables have been identified to predict a worse prognosis. But only sudden cardiac arrest and syncope with a spontaneous type 1 EKG have consistently been associated with a high risk of cardiac arrhythmic events at follow-up 3 5. The incidence of arrhythmic events (sustained Ventricular Tachycardia, Ventricular Fibrillation or sudden death) in patients with Brugada Syndrome was 13.5% per year in patients with a history of sudden cardiac arrest, 3.2% per year in patients with syncope and 1% per year in asymptomatic patients 5. The prognostic value of inducibility during electrophysiology study has been debated and most clinical studies have not confirmed either a positive or a negative predictive value for the occurrence of cardiac events at follow-up 4 5. A positive family history of sudden death has not proven to be a risk marker in any of the large studies. As different patterns may be observed in the same patient with Brugada Syndrome, in patients with type 2 or 3 EKG pattern, Ic antiarrhythmic drugs should be given to unmask type I EKG. Ajmaline (1mg/kg in 5 min IV) and Flecainide (2mg/kg in 10 min IV or 400mg oral), are the agents most widely employed. Ajmaline has demonstrated higher specificity and sensitivity 6. 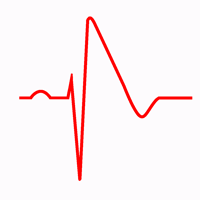 Drug challenge test should always be performed under continuous EKG monitoring and controlled conditions. Termination criteria: Occurrence of type 1 EKG pattern in at least one right precordial lead. Occurrence of Premature Ventricular Beats, Ventricular Tachycardia or QRS prolongation >30%. a. Avoidance of drugs that may induce ST-segment elevation in right precordial leads (http://www.brugadadrugs.org). b. Avoidance of excessive alcohol intake and large meals. c. Prompt treatment of any fever with antipyretic drugs 5. Quinidine has been proposed as preventive therapy in patients with Brugada syndrome, based on data showing that it reduces Ventricular Fibrillation inducibility during programmed ventricular stimulation; however, there are no data confirming its ability to reduce the risk of sudden cardiac death. According to the ESC Guidelines 5, Quinidine or Isoproterenol should be considered in patients with Brugada syndrome to treat electrical storms. Quinidine should be considered in patients who qualify for an ICD but present a contraindication or refuse it and in patients who require treatment for supraventricular arrhythmias. The only treatment able to reduce the risk of sudden cardiac death in Brugada syndrome is the Implantable Cardioverter Defibrillator (ICD). 1. ICD implantation is recommended in patients with a diagnosis of Brugada syndrome who are survivors of an aborted cardiac arrest and/or have documented spontaneous sustained Ventricular Tachycardia. 2. ICD implantation should be considered in patients with a spontaneous diagnostic type I EKG pattern and history of syncope. 3. ICD implantation may be considered in patients with a diagnosis of Brugada syndrome who develop Ventricular Fibrillation during programmed ventricular stimulation with two or three extrastimuli at two sites. 4. ICD implantation is not indicated in asymptomatic patients with a drug-induced type I EKG and on the basis of a family history of sudden cardiac death alone. Recently it has been suggested that epicardial catheter ablation over the anterior RVOT may prevent electrical storms in patients with recurring episodes, but the data require confirmation before entering general clinical practice. Therefore, Catheter ablation may be considered in patients with a history of electrical storms or repeated appropriate ICD shocks 5. 1. Brugada P, Brugada J, Brugada R. Right bundle branch block, persistent ST segment elevation and sudden cardiac death : adistinct clinical and electrocardiographic syndrome: a multicenter report. J. Am. Coll. Cardiol. 1992;20: 1391-1396. 2.Antzelevitch C, Brugada P, Brugada J. The Brugada Syndrome: From Bench to Bedside. Blackwell Publishing; 2005. 3. Priori SG, Wilde AA, Horie ME et al. HRS/EHRA/APHRS Expert Consensus Statement on the Diagnosis and Management of Patients with Inherited Primary Arrhythmia Syndromes. Heart Rhythm. 2013 Dec;10(12):1932-63. 4. Steinfurt J, Biermann J, Bode C et al. The Diagnosis, Risk Stratification, and Treatment of Brugada Syndrome. Dtsch Arztebl Int. 2015 Jun; 112(23): 394–401. 5. Priori SG, Blomstrom-Lundqvist C et al. 2015 ESC Guidelines for the management of patients with ventricular arrhythmias and the prevention of sudden cardiac death. The Task Force for the Management of Patients with Ventricular Arrhythmias and the Prevention of Sudden Cardiac Death of the European Society of Cardiology (ESC). European Heart Journal (2015) 36, 2793–2867. 6. Benito B, Brugada J, Brugada R, Brugada P. Brugada Syndrome. Rev Esp Cardiol. 2009;62(11):1297-315.